Well, we’ve made it to the end of another Digit-al Dozen week and once again, I’m amazed I’ve thought of something to talk about in this blog for five days straight. Because watching Netflix and wearing pajamas doesn’t contribute much to a riveting story. In fact, if I leave the house at all, you might as well assume I’ve been kidnapped cuz I don’t go anywhere unless someone is paying me. In money or Starbucks, it makes no difference to me. I really should be more social, I know this. It’s just hard, you guys. After sitting at a desk all day, getting up like once or twice to go to the copy machine, walking down the hall to get popcorn and a soda – I’m just dang tired. I mean, I just checked my fitness app on my phone and there are 823 steps on there. 823 STEPS, PEOPLE! Ugh, now do you see? Someone just needs to come put the pajamas on me at this point. Body = broken. It’s cute, right? I kinda like it! When my hubby and I were in Louisville, we ate breakfast at this really neat restaurant that was done up in this exact color scheme. I want wallpaper just like this all over my house. It’s super chic, and y’all know that’s just me in a nutshell. Next month, the prompt is December and I’m already thinking of things to do. I’m not a fan of winter AT ALL, but I can appreciate a pretty snowflake manicure. But that’s as far as my love goes. I’m pretty much a shell of a person until April rolls around. As always, click the button below to see the rest of the manis. And thank you thank you thank you for hanging around. Y’all make my ridiculous life infinitely better. Beautiful! 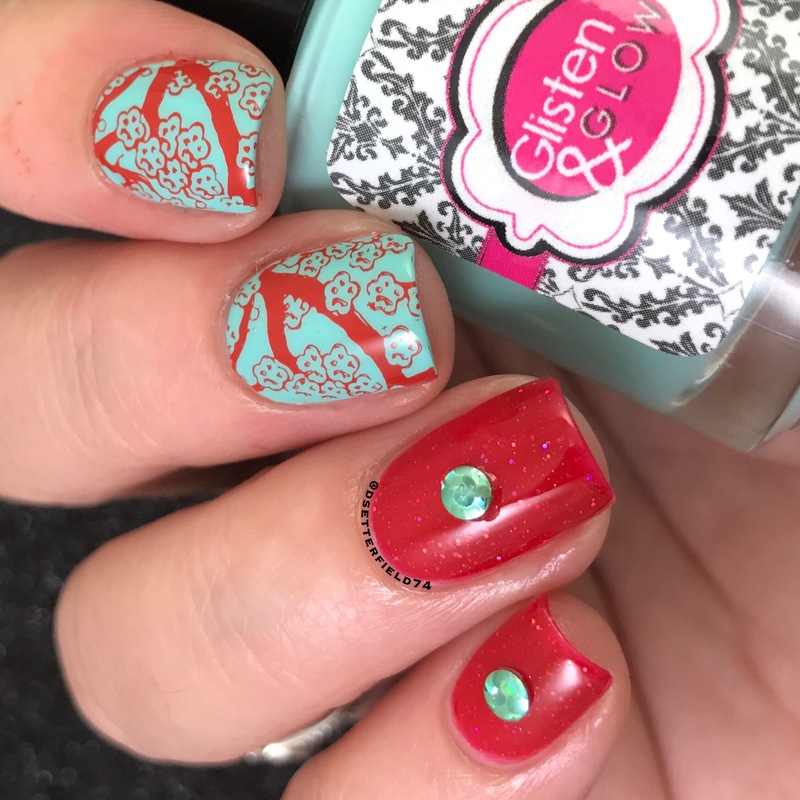 I love the red and turquoise! Thank you! I was happy with the combo too!